KAREN VIBERT-KENNEDY/Sun-Gazette Dr. Lynn Mirigian, center, speaks at the Lycoming County Substance Abuse Coalition presentation for their strategic pier goals for 2018-21 in the city on Friday afternoon. 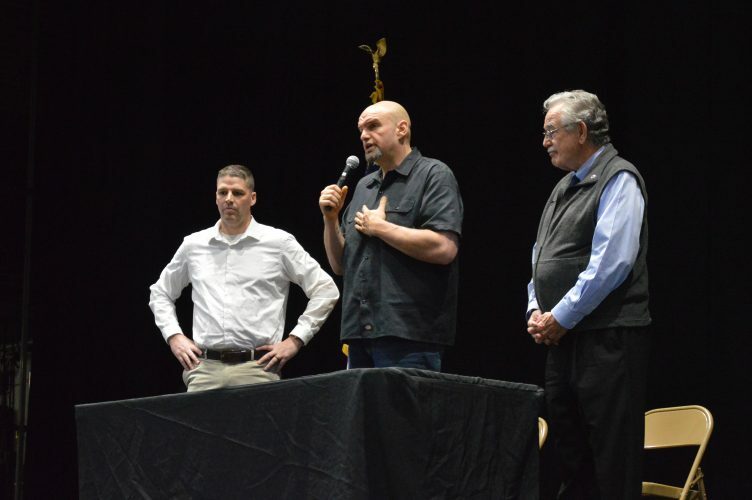 Education, access to treatment, prevention, community awareness, agency coordination, harm reduction and elimination of stigma are the top priorities for the Lycoming County Substance Abuse Coalition in fighting opiate addiction over the next three years, the coalition announced Friday in its first public appearance. 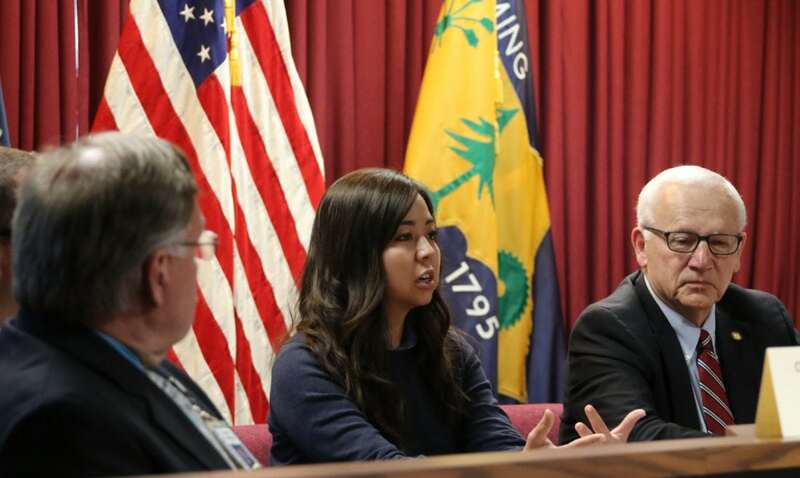 The coalition previously existed behind the scenes as the county Criminal Justice Advisory Board’s Substance Abuse subcommittee, but members decided to come forth publicly to show that there still are organizations dedicated to fighting the scourge of heroin on a local level. “We’re here, we’re working together, we need your support,” said Lycoming County President Judge Nancy L. Butts. Co-chaired by Butts and Shea Madden, executive director of West Branch Drug and Alcohol Abuse Commission, the coalition also involves the following entities: the county courthouse, prison, Department of Public Safety, and adult probation and coroner’s offices; West Branch; University of Pittsburgh School of Pharmacy; UPMC Susquehanna; Clean Slate; Old Lycoming Township Police Department; and the county Youth Development Task Force. A local pharmacist also sits on the board, as does state Sen. Gene Yaw, R-Loyalsock Township. The eclectic group hopes to use data to find solutions, garner local support and attract further resources such as state or federal funding and programming. Program Evaluation Research Unit, which helps communities identify and implement evidence-based practices by analyzing local data. They use that data “to drive real solutions,” she said. The strategic plan includes seven goals, complete with strategies and deadlines for specific objectives. The first is to empower professionals to promote the health, safety and well-being of persons at high risk of an overdose or with an active addiction by increasing educational opportunities for professionals countywide. The coalition hopes to do this through two objectives: developing an educational toolkit and continuing education opportunities to promote best practices for safe opiate prescribing and use by March of 2019; and training all first responders, health care professionals, persons engaged in treatment, county agency staff who are in contact with high-risk individuals and family members of persons with a use disorder about addiction, overdose and treatment services available by February of 2020. Its second goal is to eliminate stigma through a stigma-reduction initative. An active survey seeks community response that will help the coalition determine where the locals stand on what addiction and overdose means to them, which will help members with their third goal. The survey can be found on the coalition’s Facebook page, Lycoming County Substance Abuse Coalition. The third goal is to ensure that all residents of the county are well-informed on overdoses, signs of a substance- or opioid-use disorder, treatment options and recovery programs available locally. The coalition hopes to launch a public awareness campaign, using multiple platforms such as social, digital and print media, by June of 2019. The campaign will facilitate engagement of interactive educational tools about addiction, treatment and recovery and help the coalition develop new materials as needed. Its fourth goal is to ensure that every person in the county has access to treatment at the appropriate level of care, including medication-assisted treatment and a 24/7 “warm handoff” program. Medication-assisted treatments include use of suboxone or vivitrol to help someone step away from heroin. A warm handoff is an intervention process implemented in the emergency departments and inpatient units at UPMC Susquehanna hospitals with the goal of getting substance use patients into appropriate treatment and reducing repeat overdoses or death. By the end of the plan’s timeline, February of 2021, the coalition hopes to expand such programs countywide. The fifth goal is to increase coordination and collaboration between public safety and public health entities, creating a countywide network of pro-treatment initiatives and addressing barriers to treatment. The county has applied for a grant that will fund an increase in data sharing between entities and help the coalition with further data collection, said Chris Ebner, deputy warden of inmate services at the prison and coalition member. Such data will help law enforcement and public health professionals connect people with use disorders to treatment instead of the prison system. Sixth, the coalition plans to develop and implement a harm reduction initiative tailored to Lycoming County through local data. Research will be conducted through September, with the hope of proposing a specified harm reduction initiative by February 2019. Finally, the coalition intends to increase countywide evidence-based prevention efforts to prevent or delay the onset of substance-use disorders for target populations. By August of 2019, the coalition wants to expand current evidence-based school programs to ensure age-appropriate prevention education for all students in the county school system. A prevention initiative will be designed for senior citizens to teach them about safe medication consumption, signs of an overdose and safe storage practices. The coalition members agreed that substance-use disorder is a disease and should be treated as such. Doing so will help the community in the fight, they said.